Elephant toothpaste, 2 of 5. Elephant toothpaste is a colourful classroom demonstration of catalytic decomposition of hydrogen peroxide. Here a 3% hydrogen peroxide solution (H2O2) is mixed with liquid dish soap and some food colouring in an Erlenmeyer flask. Then powdered potassium iodide (KI) is added as a catalyst. Decomposition of hydrogen peroxide generates oxygen (O2) gas creating bubbles in the soapy solution. 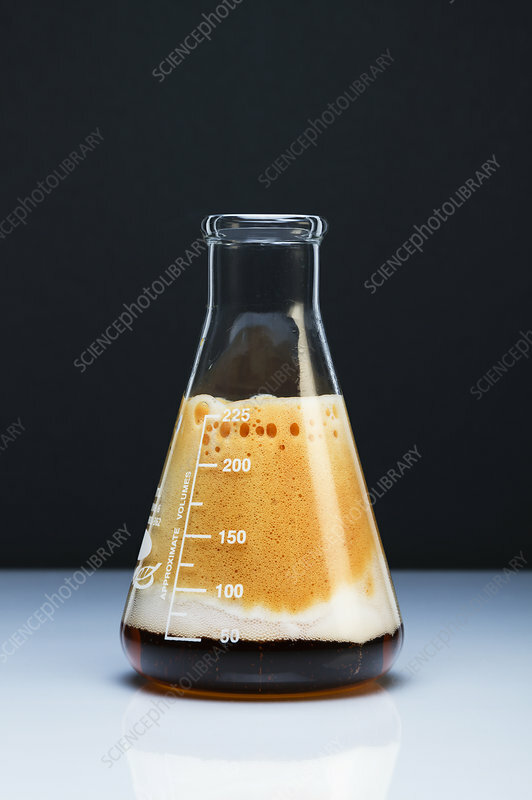 The foam rises up and then pours out of the flask. Chemically decomposition of hydrogen peroxide occurs in two steps: H2O2 (aq) + I- (aq) -> H2O(l) + OI-(aq) and H2O2(aq) + OI-(aq) -> H2O(l) + O2(g) + I-(aq).